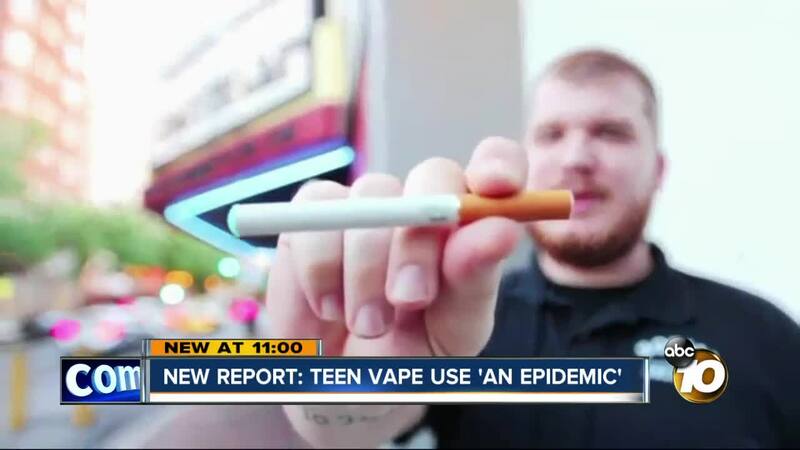 Teen vape and e-cigarette use is now being called an epidemic. That's according to a new statement put out by the U.S. Surgeon General, and the data is there to back it up. SAN DIEGO (KGTV) - Teen vape and e-cigarette use is now being called an epidemic, according to a new statement put out by the U.S. Surgeon General — and the data is there to back it up. According to the Centers for Disease Control, E-cigarette use among high school students has jumped 78 percent in the last year. It's up 48 percent among middle school students. "It's now the fastest growing substance abuse issue among that population," said Dr. Brian Couey, an addiction specialist at the Betty Ford Center. "We had the highest jump of any year of 2017-2018, of any substance ever." Couey said that part of the problem is that the e-cigarette industry is specifically targeting younger populations. "So there's a perception that it's harmless." Couey said. "Basically it's an experiment that's happening on them, because we dont have the data that we have with cigarette use." Couey said to make matters worse, the devices can be hard to spot- some look like USB drives and pens, and instead of a strong odor like with cigarettes, some flavors of e-cigartettes smell like candy or nothing at all. Couey also said nicotine levels can be much more potent than cigarettes. "It's very challenging for people in general to stop vaping," he said. "It's a public health issue." 10News took a look at teen vape use in San Diego and across the state. According to the California Department of Education, the state average of 11th graders who vape is 10 percent. For specific San Diego school districts, numbers from the Dept. of Education show that Coronado, Carlsbad and San Dieguito were all much higher than the state average, at 17, 19 and 23 percent respectively. 10News reached out to those school districts, and asked how they are cracking down. We heard back from San Dieguito and Coronado. Coronado said that the number of kids they've disciplined for vaping has gone down in the past year, from 24 kids to 14. Part of the discipline for those students includes research, where they must read articles about the health risks of e-cigarettes.